Within the 6th Global forum of United Nations Alliance of Civilizations (UNAOC) to be held on August 29th and 30th at Bali, this Alliance and the BMW affiliation pronounced the winners of the Intercultural innovation award for the year 2014. The Post-conflict Research centre from Sarajevo (PCRC) won the first prize for the project “Ordinary heroes” among 11 finalists – by the Patria Agency. 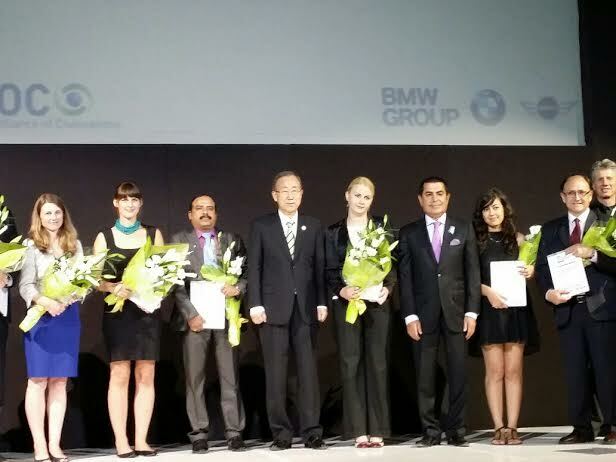 The director Velma Šarić received the prize that was handed to her by the UN general secretary Ban Ki-Moon. The prize is worth 40 000 Dollars. The “Ordinary heroes” project is the first project of the PCRC, financed by the State Department in 2010. It is focused on a specific topic of moral courage and saving. It tells a story about ordinary people who stood up and show their moral courage and saved another human being during the war, conflict and genocide – said Šarić earlier for NAP. According to Patria, CPRC was founded in 2010, and its primary objective is to, through contacts with young experts and researchers, preserve and spread the truth about events that occurred during the aggression in B&H as well as in some other parts of the world. They are focused on working in the local communities of B&H and the region, primarily with young people, preserving a sustainable peace environment and facilitating the inter-ethnic relations in B&H and in the Balkans by using creative multimedia projects and programs that help to reinforce tolerance, moral courage, mutual understanding and positive changes. The conference at Bali will be finished with the Bali Declaration which confirms the practical steps needed in order to encourage dialogue and understanding as well as religious tolerance which is at the same time the primary goal of the prize for intercultural innovation. – by Patria.